If you’re not lucky enough to be making the trip over to Russia to watch the World Cup 2018 live, then a TV is going to be your window into the action. So making sure that’s the best possible screen for the most immersive experience is a must. This is the first year the World Cup will be recorded in 4K and HDR. If we get that in the UK or not, is another matter. The BBC and ITV have shared rights for various games. Only the Beeb has managed to air 4K and HDR (HLG) which it did on the iPlayer beta as a test. So we're hoping that this will be ready for World Cup games. Even with a 1080p Full HD feed most modern TVs can enhance that to 4K thanks to upscaling. The better the TV, the better the final result, essentially. So what features do you need to look out for when buying your World Cup ready TV? Here are the five most important ones. If you’re going to get a big TV to make sure you, and anyone else you invite over, gets to enjoy the games as close to reality as possible, go 4K. The higher resolution of 4K UHD means the best possible sharpness and clarity so you can make out every player and keep your eye on the ball easily. Even if the BBC and ITV only air the matches in 1080p Full HD, lots of new TVs will upscale this to 4K. That, essentially, means you’ll get a higher quality picture so even if you have a giant screen, or are sitting close, you still won’t be able to make out the pixels – making it feel all the more real. Go big with something like the giant 75-inch Samsung UE75MU7000 for £1,899 well spent. High Dynamic Range is all the rage in the world of new TVs because it means the difference between light and dark is improved. This is ideal for football where the contrast of the ball and players against the background is an important part of a clear picture. While FIFA is recording the games in 4K and HDR, broadcasters may not air it at that level. However, most TVs now come with HDR and scale the picture to suit. That means you’re future-proofed too for enjoying high quality HDR and 4K feeds from the like of Netflix and, soon the BBC, for future games, too. 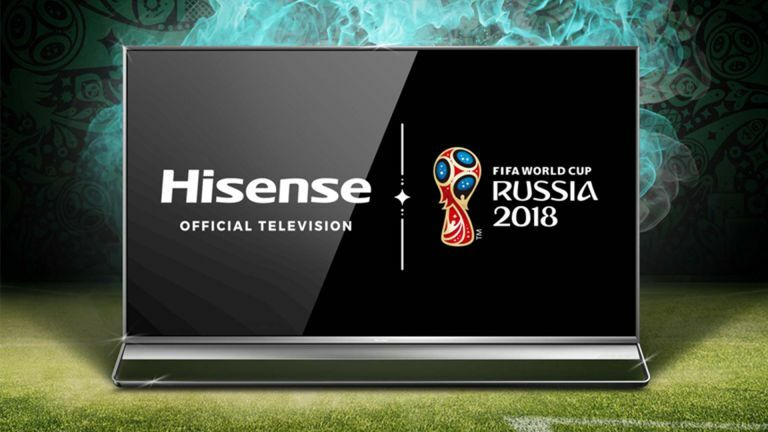 Go affordable and grab a new 43-inch Hisesne H43A6200UK with HDR10 for just £399 or splash out on a larger 65-inch Samsung UE65NU8500 for £2,199 with HDR10+. This is probably one of the most important factors to consider if you appreciate the best quality picture on a TV and get annoyed by anything less. If a TV doesn’t have a decent motion system then you’re going to spot ghosting and blur around the players. This can be annoying and may take your concentration off the game. OLED TVs are great at dealing with this issue so a top option is the 55-inch LG OLED55B7V which also comes with 4K and HDR for the ultimate picture quality for that £1,499 price. Since the standout part of a player is his kit, a decent colour reproduction can help improve clarity while making you feel more in touch with the action. A rich display across the crowd will further enhance the picture and add to the feeling of immersion. Of course, skin colour is another area that the human eye is very sensitive to, so a top-end TV will reproduce this better to give you the best possible feeling of being there. Once again OLED does this best so an option like the the 55-inch Philips 55POS9002 with 4K and HDR at £1,799 could be ideal. This also comes with Philips Ambilight tech to create a larger atmosphere using light thrown on the wall behind the TV – as if the green pitch were there in the background. Another factor to take into consideration is sound. For the immersive atmosphere of the crowd and a clear voice from the commentator it’s worth investing in a soundbar, soundbase or sound system. Televisions are so thin, their speakers really won’t do a game justice. So leave some budget aside for a sound upgrade with your new TV. You can snap up an affordable Panasonic SC-SB1EB-K soundbar with built-in sub and 40 watts of power for a meagre £159, or go for a fully capable Philips B8/12 with sub and 400W of power, Dolby Atmos surround and aptX audio for £799.